Tokunation › Kamen Rider › S.I.C Boss Teased For Release? S.I.C Boss Teased For Release? After years of being confined to the pages of S.I.C Hero Saga, it seems that Bandai may actually be getting ready to release S.I.C Boss in some capacity. S.I.C Boss was once again featured in the pages of a magazine, but this time the magazine mentioned a possible release date of March 2018 nothing has been 100% confirmed at the time of this posting, for all we know the date could be something else entirely so please take this with a grain of salt. 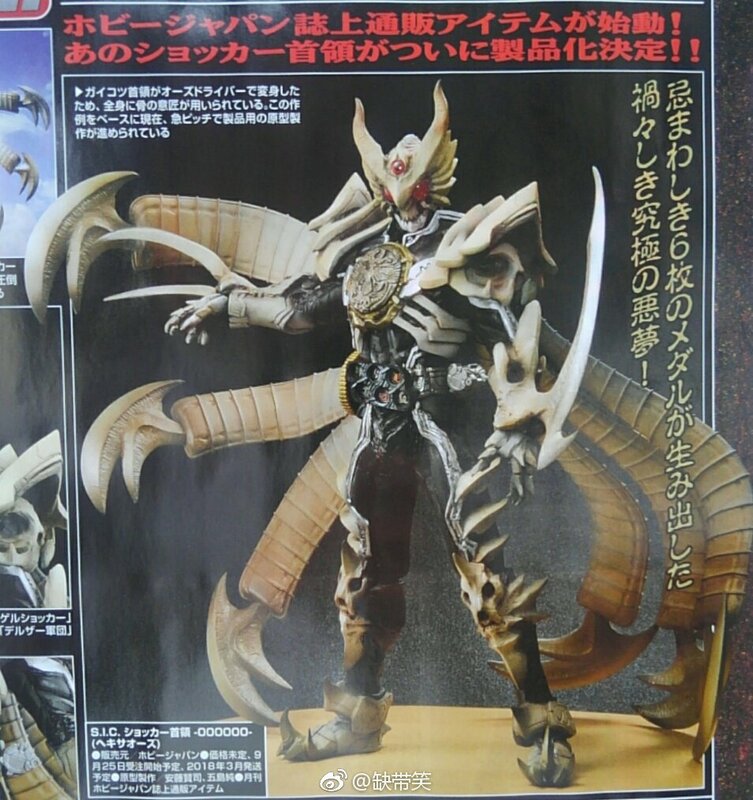 If this turns out to be real, this would only be the second time an S.I.C Hero Saga design got released since Kamen Rider Garren King Form and Leangle Jack Form! 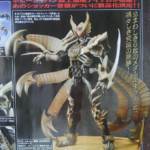 For those that are new and might not be familiar with the character: Boss was created for the Kamen Rider OOO portion of S.I.C Hero Saga: Kamen Rider OOZ which is meant to be a sequel to the OOO, Den-O, All Riders: Let’s Go movie. He’s a Rider that utilizes six Core Medals to following Greeds to transform: Shocker Greed, Gel-Shocker Greed, Destron Greed, G.O.D. Greed, the Garanda Greed, and finally the Delza Greed, he was transformed by the Great Leader. So it seems that S.I.C Boss may finally be getting released. There's a date on the magazine for March 2018. For those that don't know, Boss is character in SIC Hero Saga He's a being created by Shocker with Six Core Medals being made up of: Shocker Greeed, Gel-Shocker Greeed, Destron Greeed, G.O.D. Greeed, Garanda Greeed and the Delza Greeed. He was transformed by the Great Leader. So will this be a statue or a articulated figure ? Okay, so I can totally understand picking Delza over Black Satan, but why would anyone pick Garanda over Geddon? Garanda was easily the lamest of all the Showa evil empires. Probably because Garanda came after Geddon and they were the final villains of Amazon, that is also why they picked Delza army . In case you guys do not read Japanese his name is read Hexa-O's. Vital fo a daily, evil breakfast! Full Thread: S.I.C Boss Release Confirmed?